RBE – Rotor Blade Extension is a product that allows the length increase of rotor blades for wind turbines types Bonus 1.0 and Bonus 1.3. The extension is installed on a hanging blade, fixed to the original blade tip. Thus, the installation time is greatly reduced, allowing short downtime periods. Rotor Blade Extension presents many advantages, including the possibility to increase a wind farm production, without replacing the rotor blades or the turbines. 1. To which wind turbine models is the RBE applicable? However, further solutions are in development by EnergieKontor for a larger variety of wind turbine models. 2. How long does the RBE installation take? The required modification time is approximately three to four days per set (i.e. per wind turbine) and is assembled via a service lift. Yes, both 1.0m RBE and 1.5m RBE extensions are certified by DEWI-OCC GmbH. 4. 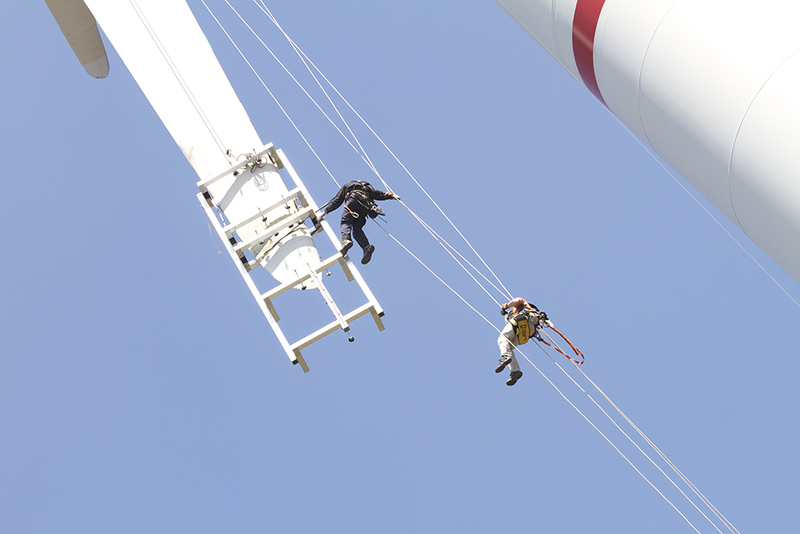 What’s the tower clearance after the RBE installation? Due to the addition of the RBE, a blade deflection increase of approximately 350mm (30%) occurs. This is still within the original design considerations, including a safety factor of 1.5. 5. What are the consequences for the rotor? Despite the additional loads on the blades, the values are within tolerances. An additional noise impact exists, after the installation of the RBE, namely around 1.1dB(A), but it is within the pre-established limits, given that the uncertainty of the calculations based on IEC 61400-11 is ± 2dB(A). 6. How is the lightning protection refitted? The original lightning receptor is refitted into the new tip, in accordance to IEC 61400-24. 7. What is the influence on the rotor’s natural frequencies? No critical changes were determined on both the rotor’s and the tower’s natural frequencies by implementing the RBE modification. 8. What are the implication on the bearings and the Yaw system? No additional vibration, nor critical changes to the natural frequencies were determined by adding the RBE modification. No influence is found on the Yaw system due to slow control speeds. 9. Is there an increase of the rotor thrust? Due to the natural increase of the rotor thrust, due to the application of the RBE, the cut out wind speed needs to be reduced from 25 m/s to 23 m/s. Therefore the absolute highest rotor thrust available is limited to the original level. This way, the pre-defined safety is ensured. 10. What are the implications on the Drivetrain and the Generator? Since the cut out wind speed is restricted, the drivetrain and generator are not subjected to any load increase. The rated power output remains the same. 11. What are the implications on the foundation? Small blade mass increase does not affect strain loads. Foundation of a wind turbine. Source: Erich Hau, Windkraftanlagen, Springer, 2008. 12. What is the influence on fatigue loads and lifetime? There is no significant influence to the lifetime of the wind turbine, given that the turbine will be subjected to less load cycles than the ones to which it was designed for. 0.8% increased 1Hz equivalent load by RBE modification. For more information regarding Rotor Blade Extension of Energiekontor, please contact us.